Cryptocurrencies across the world continue to build and emerge as a new set of currencies and financial tools. The possibilities in accountability and transparency for our own money management is unprecedented. The developments lead to promising future expansions for a global financial market. Many of us are used to seeing traditional currencies be it in our paycheck, our mortgage or utility bills, yet the options that cryptocurrency and tokens bring is utility unseen within our midst. While one may not be able to accurately predict when full general adoption of crypto occurs, it is undeniable that it is in the process and slowly building momentum to freeing us from the constraints of traditional currency and evolving our options for asset management within our daily lives. Bitcoin, Ethereum and Ripple have been some of the largest contenders for market movement and real daily use, but many new tokens and projects emerge every day primed with potential for the future. Cryptocurrencies are various tokens and coins on a decentralized ledger allowing for true ownership of monetary value. The first of its kind, Bitcoin, was released by the anonymous user or group of users known as Satoshi Nakamoto as open source software in 2009. Since then we have seen the rise of many other notable tokens and projects such as Ethereum, Ripple, Stellar, EOS and the like. Various services exist to create wallets, usually tied specifically to the token in question. Exchanges exist to allow users to trade tokens or exchange for other tokens, known as token pairs. The core purpose of a cryptocurrency is a digital token that allows the user to hold, send and exchange within a decentralized environment. This is different than the traditional model of centralized currency, such as with a bank or debit card. In essence, crypto takes out the middleman and allows full flexibility and ownership of assets to the everyday user. As a proof of monetary value, many businesses and platforms have also begun to accept crypto tokens as a form of payment for goods and services. During this process, the user pays tokens in exchange for goods or services, without the need of an intermediary party. There is an entirely new world to be discovered, the beautiful thing about it is an early stage for cryptocurrencies. Why is crypto asset management difficult? Many reasons exist, the chief of which is the complexity of many current tools and platforms. Crypto users as a whole do not have very many clear, efficient tools and are forced to not only use a variety of tools but also switch back and forth from one to the other based on strengths and weaknesses. One tool may display Bitcoin calculations and pricing accurately and effectively, while another is more suited for Ethereum and ERC20 tokens. This continues to create a divide with users that may become more and more frustrated daily. With that said, the technology itself is always changing, with many tokens producing forks, rebrands, and movements. This continues to create a need for flexibility and pivot within the tools available to users, to ensure the information is both accurate and quickly available before making strategic and important market decisions with their token balances. Cryptocurrency asset management during times of volatility. 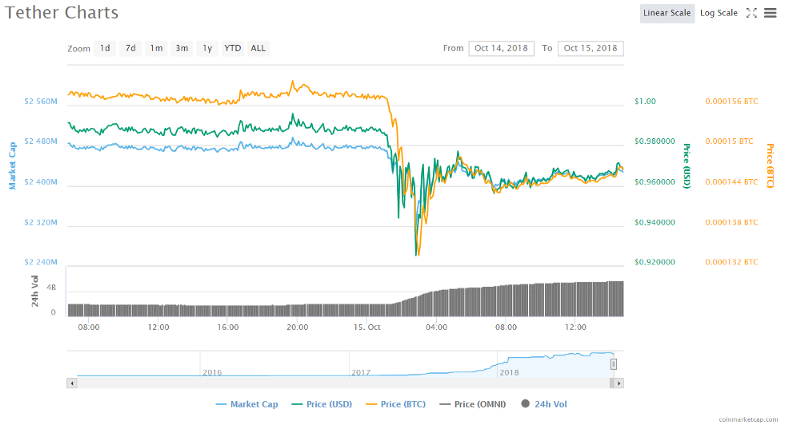 The recent volatility of the “stable” coin USDT, or Tether, has created a veritable rollercoaster within crypto markets the last few days. While Tether was one of the first institutionally minded tokens to be released as a stable pair for fiat currencies and token holdings, the recent market movements are affected by emotion and news cycles as well. Market participants and investors alike rely on accurate cryptocurrency asset management during these times. This brings to question, what is the future of cryptocurrency as we know it for fiat based token and pairings? Before we dig in, let’s look at the market data. A quick perusal of charting shows an image anything BUT stable. One need not look far to find questioning thoughts and opinions regarding Tether’s usage within the industry. A concise summary of the last few days identifies that negative news and investor confidence has decreased, causing a high volume sell-off from USDT to other notable crypto pairings. During these times, users rely on accurate & up to date crypto asset management tools. The volatility of the cryptocurrency markets is nothing new, but ongoing trends force users to identify and use appropriate tools to increase the experience and education of daily trading. These tools become the “bread and butter” of a wide variety of users within the industry. How can I accurately ensure proper cryptocurrency asset management? More old-school users of data management may prefer using spreadsheets to manually enter daily trades, holdings, and exchanges. While this is time-consuming and tedious, it does allow for meticulous detail of each individual transaction through a manual model. More enterprise level consumers may wish to utilize the expanding group of asset management available through custodial management services. While all-inclusive, these options can be time-consuming and costly to begin initially. Most asset management firms require in excess of $1,000,000 in funds to manage portfolio accounts. Many notable websites exist to allow for an accurate and up to date tracking of current market metrics and trends. Users may utilize these features to keep up to date on various exchanges, tokens and projects while refining their own holding and transaction strategies. With the increasing market of crypto, a few application based crypto asset management tools have been developed and are available. Many of these tools are available in a mixture of web, Android and apple-based applications for ease of access to the consumer base. These tools are more widely used by the consumer base of crypto. Blox has created one of the most robust and efficient platforms for this very purpose. Blox’s vision remains to allow for up to date, quick and efficient management of all crypto tokens for its users. Social Media is biased, tracking tools are not. Blox is developing the next generation cryptocurrency asset management platform to allow for traders and HODL’ers alike to have the accurate tools necessary. By putting the tools into the hands of those involved daily with crypto markets, Blox is progressing education and insight for users across the globe. Many users rely on up to date statistics of ongoing token prices. Blox allows for a detailed list of synced deposits and withdrawals, allowing users to track their past market orders. This allows for an educated trader, an insightful HODLer and an informed user. Cryptocurrency asset management drives general adoption. Users familiar with traditional financial models, yet new to crypto are adapting to the tools presented to them. Blox is redefining cryptocurrency asset management. This is no shortsighted endeavor, but the culmination of a long-term commitment to blockchain technology and crypto services.